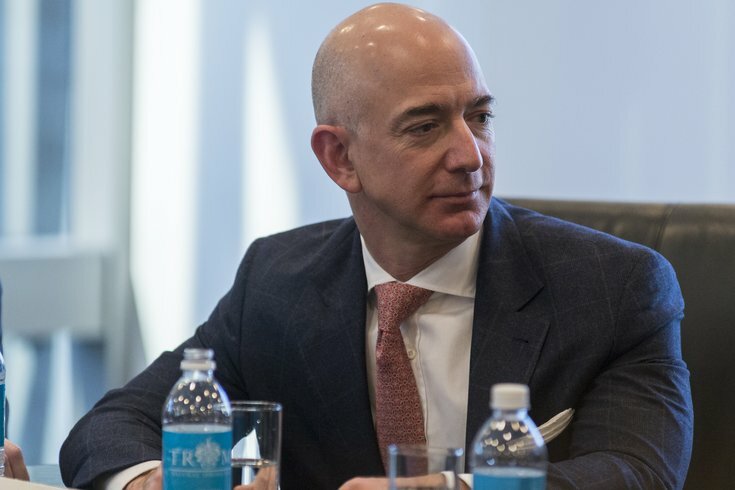 Amazon CEO Jeff Bezos is seen at a meeting of technology leaders in the Trump Organization conference room in December 2016. Beginning Nov. 1 Amazon will increase its hourly minimum wage rate to $15, applying to full-time, part-time, and temporary employees. According to CNN, the minimum wage jump will benefit more than 250,000 employees, plus 100,000 seasonal workers. This also extends to Whole Foods employees, as the internet retail giant acquired the grocer last year. The change comes after some public backlash against Amazon, which has created more American jobs than any other company in the last decade, for not raising its minimum wage. The minimum hourly pay rate for Amazon previously ranged from $11 to $13.25. Several other major retailers have raised minimum wage rates in the last year, though few have caught up to $15 an hour. At Target, the minimum wage was upped to $12 last month, and the company announced an initiative to get it to $15 an hour by 2020. In February, Walmart also increased its minimum wage to $11 an hour. Next year Disney will begin paying $15 an hour to California employees. Disney employees at the Florida theme parks will receive the $15 rate in 2021. Amazon also is upping the minimum wage across the pond for its employees, increasing it to about $13.60 in USD in London and $12.30 in other parts of the UK. Amazon will reportedly begin lobbying for an increase in the federal minimum wage, as well, which was last increased to $7.25 in 2009.